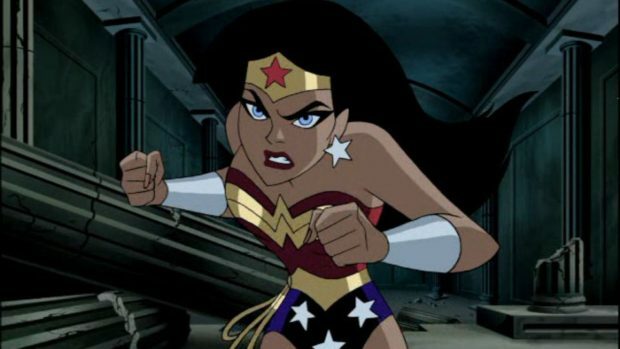 When we last saw our heroes, the Justice League was collecting three relic fragments, thanks to the blackmail of Felix Faust, who has turned the Amazons of Tham-Madagascar into stone (Editor’s note: Michael cannot spell Themyscira). Superman and Wonder Woman were in a tussle, Flash and Martian Manhunter were fighting a giant snake, Batman was investigating the background of Felix Faust and Felix himself was trying to open the gate to the underworld so Lord Hades could be released. The League, having collected all of the relic parts, are unsure if giving it to Felix in exchange for freeing the Amazons is the right move. They go to Felix’s house (he’s listed in the phone book?) and discover some background information on Felix, Lord Hades, Hades relationship to Hippolyta and the location to the door to the underworld. Honestly, it all went right over my head, as does most of Wonder Woman/Tham-mushroomara lore, but the gist is that Hippolyta and Hades used to get it on. Regardless, Batman is able to assemble the relic fragments (hey, they make a key!) and come up with a crafty Bat-plan. The team meets up with Felix at Tham-MaybeItsMabeline and offer him the key in exchange for freeing the Amazons. Felix releases Hippoliyta, just Hippolyta, and then takes the key and runs. The League gives chase and a battle erupts. During the battle, Flash is able to steal Faust’s Medusa medallion, the mystic item that keeps the Amazons in stone form. Faust distracts the League long enough to kidnap Hippolyta and sneak off. Fortunately, the gate to the underworld is on Tham-DriveaCar, so everyone pretty much knows where he went. Faust opens the gateway to the underworld (which looks an awful lot like a metal door with some wood bracers) and Lord Hades makes a fiery entrance. Felix offers Hippolyta as a sacrifice to Hades, but he would rather rekindle the old flame. Before Hades can get his mojo working, Felix asks to be repaid for all his hard work. Hades betrays Felix (do those deals ever work out?) and turns him into a withered old man. You know, in those magical robes and crown, he looks just like my grandpa. The Justice League arrive and another big battle erupts. Hades raises an army of undead so that each member gets their own mobs to deal with. This is actually fun to watch because the animators show off the different fighting styles of each member. Batman uses his Bat toys, Flash uses speed, Superman fights with raw power and Martian Manhunter uses his intangibility. Neat. In the end, good guys win and bad guy loses. 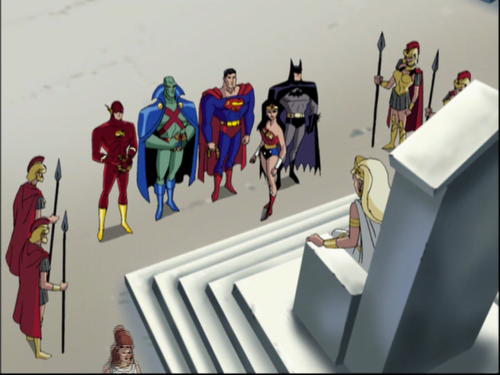 Wonder Woman and the League are honored by Hippolyta and the freed Amazons. Happy ending looks eminent until the queen banishes Wonder Woman from Tham-howthehelldoyouspellit for bringing men there.